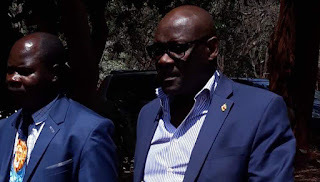 Former Health and Child Care Minister David Parirenyatwa was yesterday arrested and appeared at Harare magistrates’ courts on charges of criminal abuse of office. The arrest is seen as part of Government’s effort to eradicate corruption that had reached epidemic proportions in several Government ministries and parastatals. Parirenyatwa was not asked to plead to criminal abuse of office charges as defined in section 174 (1) (a) of the Criminal Law (Codification and Reform) Act chapter 9:23, when he appeared before Harare magistrate, Mr Elisha Singano. The State, led by prosecutor Mr Michael Reza, did not oppose bail, but proposed that Parirenyatwa pay $1 000 coupled with stringent conditions. Mr Singano reduced the bail to $500 and remanded Parirenyatwa to October 26. Parirenyatwa (68) was required, as part of his bail conditions, to surrender his passport to the clerk of court and to report twice a week, on Mondays and Fridays, at the Criminal Investigations Department, Anti-Corruption Unit, Morris Deport. He was also ordered not to interfere with State witnesses and to reside at his given address until the matter is finalised. Charges against Parirenyatwa arose on June 4 this year when he was still Minister of Health and Child Care. He allegedly abused his position as a public officer and directed NatPharm Board chairperson Dr George Washaya to terminate the contract of Flora Sifeku as managing director, allegedly showing favour for Newman Madzikwa who had once been sacked from the pharmaceutical company for reportedly selling donated drugs. At the time he was fired in September 2009, Madzikwa was NatPharm’s Masvingo branch manager. The indictment also revealed that Parirenyatwa had indicated that he required Sifeku’s services at the ministry’s head office for an indefinite period. The board, it is alleged, complied with the former minister’s directive and gave Sifeku and Madzikwa six months contracts each as managing directors effective June 1 to November 30 this year. It is alleged that Parirenyatwa’s conduct created a double dipping on NatPharm funds as the company was paying two salaries towards the managing director’s position, thereby prejudicing it of a total of $30 006. The crime allegedly came to light through a tip-off this week, leading to the former minister’s arrest yesterday. The State further alleges that Parirenyatwa’s actions were prejudicial to the good administration of NatPharm and the Ministry of Health and Child Care. The former minister, who is being represented by Mr James Makiya of Makiya and Partners Legal Practitioners, was dropped when President Mnangagwa announced his new Cabinet on Monday this week. President Mnangagwa has made the fight against corruption a key policy plank. Former Energy minister, Samuel Undenge was recently arrested for criminal abuse of office during his tenure and convicted. Undenge was sentenced to four years imprisonment, but is out on bail pending appeal against both conviction and sentence. Other former ministers who have been arrested are Ignatius Chombo, Walter Mzembi and Saviour Kasukuwere. Chombo and Mzembi are yet to be prosecuted for similar offences while Saviour Kasukuwere was acquitted on a charges of border-jumping. To speed up the fight against corruption, President Mnangagwa established a special Anti-Corruption Unit housed in the Office of the President and Cabinet in May this year.